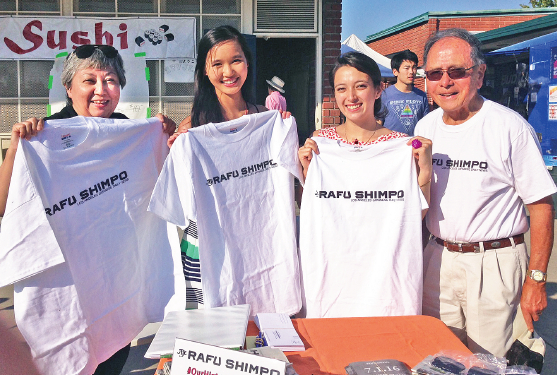 Ellen Endo and I, along with two Nisei Week princesses, sat at a folding table at the Obon last weekend. It was a task I was happy to do as my part in soliciting subscriptions and getting the word out about the latest news concerning The Rafu. There were a lot of questions, and I was glad to have Ellen, who was well-versed on the subject, at my side. Ellen brought along an impressive roll-out banner with “Rafu Shimpo” printed in large letters, which stood behind us. As shown in the picture, Nisei Week Princesses Kelsey Kwong and Veronica Ota were there to sit with us. As usual, our JACL chapter had our doughball booth going, so my wife, Marion, divided her time between it and our table. She was the most assertive, asking each person passing if they subscribe to The Rafu. Most people responded agreeably. Our friend John is white. He and his JA wife are active members of the community center. I was encouraged when he enthusiastically told me that he and his wife have a regular subscription as well as the online version. The Obon Festival drew a large crowd of dancers. Priscilla is co-chair of the committee at the temple responsible for organizing the Obon. I asked her to relay our thanks to the committee for allowing us to have the table. She said that ordinarily the committee does not allow participation of for-profit organizations, but they were unanimous in agreeing to allow for this exception. 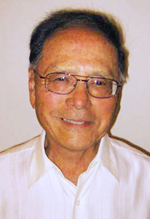 I was glad to learn about Rafu’s imminent plan to form a non-profit foundation. It was good to be able to become acquainted with Ellen. I told her I have enjoyed reading her columns for years (decades?). She reminded me that at one time she was editor before leaving for a position in a major studio and forming her own company. I was glad to hear that she is providing leadership in plans The Rafu is making for the critical months ahead. I was surprised to learn she lives in the Valley. I invited Ellen and her husband to participate in our JACL and community center activities. From left: Ellen Endo, Kelsey Kwong, Veronica Ota and yours truly were on hand at the San Fernando Valley Japanese American Community Center to help spread the Rafu word. Princess Kelsey was a personable young lady and fun to talk to. She was active in the Valley’s athletic program before her family moved out of the Valley. I showed her the picture of our Chinese grandson, Miles, who has just finished his first year at Cal State Long Beach. She and I are both Yonsei, although separated in time about 60 years! Kelsey’s grandmother was in Manzanar, before relocating to Seabrook, N.J. Kelsey recently graduated from UC San Diego, and plans to apply to medical school. 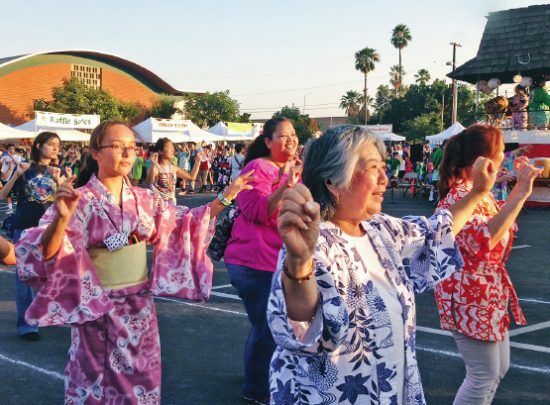 She seemed to enjoy herself as she got up to dance in the Obon. I did not have much of a chance to talk with Veronica. I was interested in finding out that she attended Tufts University in Boston, where Marion’s nephew graduated a few years ago. We are visiting Boston in the fall and Veronica made a couple of suggestions as to places to visit when we are there. Having some of the Rafu staff get into our community is a great idea. In addition to gaining subscriptions, making an appearance made for good public relations, and I think all who participated would agree that we gained knowledge and new insights from the experience.